I bought my 99 VFR a couple of weeks ago...upon arriving home, gave the bike a good going over. Reading about all of the charging gremlins the VFRs have, I decided to check out the electrical system. When I measured the voltage, I found the voltage output was way to high at higher RPM and to low at low RPM...pulled the regulator, found a hole burnt in the back of it with a solder trail coming out...DOA reg. I called the dealer where I bought the bike told him the problem - he gave me a new regulator no charge (the updated one even). After installation, things were better but, I felt the voltage was still on the low side and unstable. First thing I did was pull all connectors apart and check them for coorosion or burning (none - all was fine) and give them a dot of grease. next I cleaned all OEM ground points and reassembled with lithium grease. Voltage came up some but, not what I considered acceptable and it was still unstable. Next, I'm thinking of upgrading the actual stator wires...for now, I think I'll just ride awhile. Please describe what you mean by "commoned them". I can solder, but don't know the methods of connection, connectors to be used, etc. What is your method of connecting the new add'l 12 ga wire to the two green wires on the R/R plug? What fitting did you use at the battery positive terminal that accomodated the 2 new 12 gauge wires? Or did you use two separate fittings? Did you bypass the stock R/R feed to the stock harness through the white connector on the skinny red wire, or is that still connected? If so, how did you attach the two new 12 ga postive wires to the R/R positive output? Finally, why did you run the R/R negative to the frame, rather than to the battery (as you ran the R/R positive to the battery)? Thanks for your work on this. Very helpful. you forgot to add some heat transfer compound to the back of the r/r and a computer fan on the front . I also (to aid cooling) drilled 4 holes right in front of the RR, not sure if it'll help, but sure can't hurt. I'll try to snap some pics and get them posted. WOW â€“ I didnâ€™t expect this kind of response but, Iâ€™m glad to helpâ€¦. NO OEM wires were cut or interrupted. The new wires are supplemental to the originals. I prefer the button hook method for larger wires since they take a lot heat to solder properly (usually damages the insulation). Button hook = strip an area of insulation appx Â½â€+ long off & completely around an existing wire so you have a bare section in the wire. Then open up a hole in the bare section (I use an awl or small screwdriver and poke it through the center of the bare section and open it up. Strip back a good portion of the new wireâ€¦1â€ â€“ 1 Â½â€ should do for 12 gaâ€¦youâ€™ll know how much when you do it. Thread the new wire through the hole in the existing wire, then wrap it around the bare area cinching the hole closedâ€¦keep tightly wrapping the new wire around the bare section until the entire bare section is covered â€“ keep it neat & tight and cut off any excess. cover the connection with tape or shrink wrap if possible. To common 2 wires â€“ you simply hook the new wire through 2 existing wires cinching them together. -I connected the RR ground at the frame to avoid having to much crap at the battery. -I connected (button hook) the additional charge leads from the RR to the main batt cable right before the OEM terminal to avoid to many connections on the batt bolt. I have yet to find something it hasn't helped...cars are worse than bikes but not as sensitive because they have a larger charging system. Yea, all the above might prevent this..
Fuse? Can anyone explain why the fuse didn't blow? Yamaha part on my VFR-bad Karma? After the second stranding via a Honda rectifier..BTW-the sticky surface on the back of the rectifier made a good thumb print impression for an ultimate identification. To clarify for me, you left the OEM arrangement for the R/R to the stock harness and just added wires to it? You didn't cut the R/R/harness connector out and direct-wire the R/R charge wires into the main battery lead? I took a different tack and may need to change it. I bypassed the stock charge wire and cut it out. I direct-wired the R/R charge wires together, then tied them to a single 12 ga wire that I ran to the postive battery post as an add-on. I figured the 12 ga wire would be sufficient, given the skinny R/R charge output wires, and didn't want more wire than I needed. Then I bypassed the stock harness and direct-wired the R/R ground wire to the brake valve ground, where the main battery ground attaches, again using 12 ga wire. I picked up a little (1/4 volt) with this direct wire arrangement, but, after hitting 14.6 or so at 1,500-2,500 rpm, then decreasing as rpm increases, still ends up at 13.94 v warm @5 k rpm, clean connections, brand new battery, brand new upgraded R/R and brand new Honda stator. Hence my interest in your technique. Thanks again. B ) Not to upset the original OEM wire integration just in case it mattered...if it does, I'm safe, it it doesn't then nothing hurt. I think you should at least double up your wires...age old rule concerning wiring: You can never have to much. Another possible problem...I think the OEM runs the RR wires to the starter THEN it distributes from there. You have essentially reversed that (batt first, than starter) not sure if it matters, but, it could. When my '90 VFR750's R/R died, I just had the dealer install a new (aftermarket) one. When I had a look at the job he did, I wasn't too impressed, so I decided to "do the whole thing properly". First, I decided the RH-side location under the rear cowl was about the worst place (short of the exhaust headers) it could be mounted, so I remounted it on a piece of 3mm aluminum plate under the headstock (where the horn normally resides). Next, I reckoned that all that thin wiring and connectors were a bad idea, so I cut it all off, from the stator plug back to the battery. I then relocated the stator wires, so instead of coming out of the left side and running across the engine to the right, they came out of the left side. I cut these as short as I could (without taking the engine cover off) and connected in some large gauge wires from there to the R/R, crimping and soldering the connections before heatshrink covering them. (My electronics soldering iron didn't hold enough heat, so I used my leadlighting one). I ran one ground to the ground point on the water rail between the engine V, then the other back to the battery. It had two (2) positive outputs from the R/R, so I commoned them and ran a very thick wire back to the battery, via a 30A inline fuse. All connections were crimped and soldered, heatshrunk, and then I covered the whole lot in that split trunking and zip-tied it up. I can't remember for sure, but I think I got about 14.6V max, and about 13.2 at idle. Apart from the R/R, the whole job cost me only a few shekels. The hardest part was the soldering, but I fond that by wrapping the joints with thin electronics solder, and using lots of heat, it worked OK. I'm not electrician by trade, but back in the day when I was a electronic technician, I do remember that "given a constant voltage and current load over a specific length of wire of a specific gauge", then there will always be a specified amount of "voltage drop". If your intent is to reduce this drop in voltage in this span of wire, then you must either shorten the span or increase the gauge of wire. Increasing the gauge of the wire also increases how much current the span can safely handle, as well as total wattage. BINGO - what I did basically does both. I think the main problem is the initial length ran in the OEM wiring prior to reaching the battery & fuse block. ???????????? --------> DOES ANYONE KNOW WHERE THE OEM ENGINE GROUND CONNECTS? I would like to tackle that next. Location:Belmont, CA Who wants to go up Hwy 9 to Alice's restaurant for lunch? well, when i did my RR i soldered theyellow leads to the stator eliminating the connector. i also did a button hole tie in for my extra black lead since i used a 6th gen RR on a 5th gen but i soldered it. Always solder. Always. Dont argue about it, just do it. Motorcycles are a harsh envirornment for electrical connections, and you solder for teh same reason you use grease on connectors, not because it helos the connection (it makes it a bit worse actually) but that it does keep it from corroding and therefore makes it stay the same for a long long time. A soldered button hole joint wrappped with e-tape or painted with liquid e-tape will last you a lifetime, but one tha is just wrapped will probably last 5 years at the very most if you did a really good job in wrapping. Moisture (and sometimes salt from oceans or roads in winter depending on where you ride) gets in there inevitably and makes your connection degrade, and then it turns into a resistor and starts getting hot, and then fails, or maybe fails intermittantly. Many years of working on Boat wiring, motorcycle wiring, and industrial wiring in a plating shop have shown wihtout a doubt, you want solder to improve the joint and make it not corrode again. This is the same school of thought as to why you gold plate connectors. Gold is not as good a conductor as you would be lead to believe, it is actually usually worse than what it is going on. However, because it resists corrosion, it will at least ALWAYS be the same level of connection rather than degrading rapidly over time as whatever surface oxidizes as would alum, steel, copper, silver, etc... This makes a reliable connection and that is usually more important (think AV cables that are cheap and need twisted every so often to get your picture and sound right). As far as oversizing the wires, ya, thats a good idea too as they are just a hair undersize for some reason so doubling them up creates extra capacity and lowers the resistance of them significantly. Speaking of the RR, the otehr reason they fail is there is NO AIRFLOW in there... i put a fan on my orig one and it still failed (or was already failing). If you look at the space it is in there is no exit for air. Air wont come in and flow across if there is no exit. The newer ones are up front in the fairing i believe where they get more airflow. i was thinking of drilling a 1" hole in the underside of the tail side plastic and putting a clamshell cover over it to help vent air and still keep chain grease and moisture out of the area, but havent done so yet. As for charging voltage distribution, as I understand how things are OEM wired, you are correct and the charging voltage-to-battery connection off of that skinny red wire is the last stop, after first passing through the starter solenoid, etc. My routing has taken the OEM harness (and consequently, the starter solenoid) out of the charging circuit completely. I've noticed no operational issues resulting therefrom, but I'll give some thought to reestablishing the OEM arrangement. Re: Engine ground point - I don't know, but that eliminating that possible ground point's corrosion issue (with consequent bad grounding, etc.) was one of the prime motivators for my wanting to carve the OEM harness out of the equation. Ok, here's a couple more questions. I have the wiring diagram in front of me (I could make copies showing what I think you mean, and post them), and of the 2 red/white wires that go into the reg, one comes from the battery, and the other one goes to the main connector for headlight, dash etc. My first question is: Do you use the same fuse, add a new one or bypass it all together? 2nd question: Would it work to take the terminal off the connector for the reg, solder it with the bigger wire and put it back in? 3rd question: Knowing that the second red/white wire isn't a link to the battery, do I still need to double it? 4th question: I noticed that the 2 red/white wires are connected together at one point, shoud I use that instead to connect the bigger wire? It does by pass the fuse...you could add one...but I would put one in each wire individually. IF there is a short that could cause a problem, it would have to be in that 8" piece of wire. Highly unlikely really. If it's in another area, the OEM fuse will take care of that. If you wreck bad enough to cause a short in that wire, I think the wire will be the last thing you need to worry about. In all actualities, the wire will actually function as a fuseable link if no fuse is used. Majority (possibly all) of OEM auto manufacturers DO NOT use a fused charge lead - no reason to really. I would just add the wires. It will keep the charge leads as short as possible and maintain the OEM wire routing for the original wires. IF the original wires coming of the reg simply go straight to the battery (and are short) replaceing them out of the plug would be fine but the wire would have to be completely replced from the reg to the battery to be most effective. Doubling up both of the wires and hooking directly to the battery maximizes the charge potential. 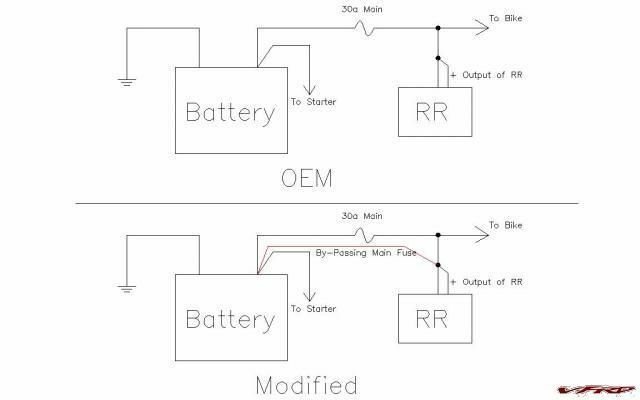 If the RR only has the single lead going to the battery for charge THAT is the major problem in the system. True that auto's don't use a fused charge lead, but the RR is on the fused side of the battery already, if you provide a direct link from the rr to the battery, you just by-passed the 30a fuse for the entire electrical system. In your system, you could remove the 30a main fuse and the bike would still function normally. Have you looked at the wiring diagram? Battery>30a Fuse> Y splice with one lead going to the RR the other going to bike power. You went directly from the RR to the battery, therefore the existing 30a fuse could be removed completely from the system and be function normal. Since you have the diagram at hand, what does the OEM 30amp actually interrupt that is not protected @ the fuse panel? Just curious. If it is just the charge lead to the battery, I wouldn't worry about it. That would mean the 30 amp fuse is protecting the originall RR wires. Like I said, if it's something that concerns you, fuse each additional lead individually...it's a good idea, just not something I did. ahhh, its protecticing your main harrness. if you have say your headlight wires short, the 30 fuse will blow saving your entire harness from melting. wires make terrible fusible links as they are usually bundled with other wires which they can melt to in a short failure situation. you would have to increase the wire size from RR to batt, RR to fuse, fuse to main distro point to gain the benefits while still being protected. Sorry, forgot about that fuse when i gave advice earlier, nice catch. Well, and my bike is tucked away in the garage since we have had 4 days of freezing rain and even a bit of hail... i should have gone and looked. I would pin this but there are too many open questions on exactly how you did it, and there are quesitons as to why you bypassed the main bus fuse? If you could perhaps draw and scan in a diagram or use ms paint? or take some digital photos of how you did it so we can plainly see whats involved - pics solve a lot of questions that are difficult to explain. there is a great how to in the maint section > how to guides on how to perform a linemans soldier splice its easy to perform, is secure and does a good job of making a solid connection. Sorry...I have a good knowledge of electrical and always take it for granted everyone does...my mistake. When I did this, it was basically for myself - after seeing the results, I decided to post up what I did and the results (since this seemed to be an on going problem concern) to share with others. I never intended this to be a detailed tech "how to" therefore, I never took any pics and didn't post all of the specific fine details. Maybe someone else will snap some step by step pics if/when they do this. If you're not comfortable with the mod, I would suggest not doing it. As far as bypassing the main fuse - this was admittedly an over sight - a fuse or fuses would be a good idea. The connector at the battery is plenty heavy to pass the current this system provides. ok, i would like to wade in here and ask a question. first it seems to me when you turn your key on, everything is now on, and the grounds near or at max draw. you push the starter buttom and things dim. would this problem be helped by running a large ground wire directly to the starter mount bolt? or is this back to the power side being overtaxed? Um, yes and yes and no. Yes starting is the most taxing moment the elec sees, and upping the wires might help a bit but not really since they are only carrying load for a few seconds and dont have a chance to get hot and be a resistor. The ground might again help a little depending ont the resistance of your gound circuit under that load (snap on makes a kool tester...) but the limiting factor is probably just your battery. It can only put out so much juice at 12.5v befoe it drops, and drops, and drops... on a dead short it may sit at 6-7 volts for a few seconds before you melt something. So cranking it may drop to 11 volts or maybe 10 depending on your battery age/condition/attitude. I have seen vehicle with REALLY bad, frayed, corroded battey cables/terminals go for a long time since they only needed about 1/2 a second of juice time to get the motor started. Now, take that same situation and run out of gas and need to crank it for 30 seconds, well, that is the start to a real bad day and a big bill to fix everything you have been ignoring as you are now S O L.
Just for fun, I started the bike and measured the voltage before putting the fuses in the new holder (basically, running the bike with the new ground wires still intact but the new RR power leads disconnected). I was curious to see how much the new charge leads actually improved things. I then dropped the fuses in place and voltage went up to 14.3 immediately, then settled at 14.6 (I think the stator was under load - I had not ran the bike all week, no batt tender). So - the new charge leads absolutely improve the situation. Here is the wiring diagram of what I did. 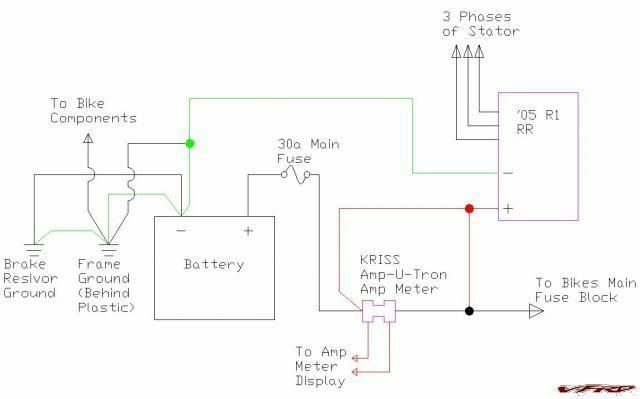 You won't have the Kriss Amp-U-Tron in line, but you can mearly cut the main feed to the battery and splice in an extra wire to boost charge to the battery. Wiring Upgrade New + Wires in Red, New - Wires in Green. All wires used are 12ga high strand. Keep in mind that when you have the extra wire coming directly from the RR to the battery, and you add a second 30a fuse, you then have on the bike side of the battery, 60a of potential. To prevent this you may want to change the 30a fuses for 15a or 20a fuses so as not to have such a huge potential in case of a dead short. You ran one 12 ga wire from each of the R/R's positive outputs and buttonholed them into the big stock to-the-battery positive terminal somewhere south of the terminal, itself (ignoring the amp meter issue). True? Then you ran the R/R ground directly to the battery negative terminal? Then you buttonholed the R/R ground to the frame ground? Then you ran a second ground from the R/R ground line from the battery negative terminal to the frame ground under the plastic? Then you ran a separate ground wire from the brake res to the frame ground? If not true, please clarify as to how these wires are physically attached. Sorry in advance if it's my electrical ignorance but if it helps, I am learning a lot, and others likely are, as well.